Team Daiwa Fuego-A Spinning Reel is advanced, smooth, and reliable. Exceptionally light ''Zaion'' super-carbon material in the body, rotor, and sideplate feels as light as magnesium but delivers unparalleled strength and corrosion resistance. 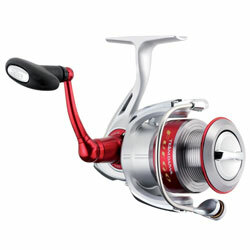 This reel features Daiwa Levelwind; up to seven ball bearings, including Super Corrosion-Resistant Ball Bearings (CRBB) bearings; super-smooth waterproof drag; DigiGear digital gear design; super strong, yet ultra-lightweight Air Bail; Twistbuster line twist reduction system; Infinite Anti-Reverse; and a free aluminum spare spool. "Best Spinning reel I ever used. I live in Southern California and fish the highly pressured clear lakes w/ a spinning reel about 75% of the time. I bought one last month and loved it so much that i'm buying 3 more."